Virtual Fun Run – megameterrun from @notreallyltd on Vimeo. This project was in partnership with United Purpose, an International Charity that has a long history of working alongside government institutions and international actors engaged in nutrition in the Gambia: and have collaborated with the National Nutrition Agency (NaNA), NARI and the National Food Safety and Quality Authority, as well as with Food and Agriculture Organisation (FAO) of the UN, with whom they have a Memorandum Of Understanding (MOU). United Purpose is established as a charity in the Gambia (and the UK where it is headquartered) and works in Partnership with ‘Wuli and Sandu Development Agency’ (WASDA) and others. Firstly, as a result, where previously no support partners were willing to come forward we have successfully managed to work with WASDA and the hardworking, committed and entrepreneurial Mansajang community group to establish a working garden. This has supported approximately 100 women (and one elder man!) to improve infrastructure, complete a water well and multiple troths with taps, provide training and protect against the rainy season floods. This has extended the capacity to grow 3 annual harvests (compared to just 1 in the rainy season) and improve yield all to grow vegetables for income, and to improve family heath and nutrition. ‘Reducing micro-nutrition deficiencies of women and children in The Gambia through sustainable and integrated approaches to food fortification‘. The project is addressing nutritional problems of women and children and includes support to women’s gardens, women and children nutritional health clubs for nutrition education, among others. WASDA will be an implementing partner in Upper River Region. Work will be implemented through community CSOs such as women’s co-operative groups. Paul Blackler and Isatou Njai have an existing knowledge of and relationships with communities and organisations in Upper River Region of the Gambia. Working with UP allows fundraising to be managed through a credible NGO with good connections and capacity to deliver funds to beneficiaries, for sustainable long term impact. A range of Gambian development factors drives deficiencies of essential vitamins and minerals, such as: poverty, dietary change, decreasing food production and resilience and lack of women’s education on nutrition. No value-addition and agro-processing, with smallholders selling only the raw products, limiting opportunities for growth, and often contributing to produce waste. Poor handling knowledge leads to lower yields and poor quality reduces chances of private sector engagement. Under-resourced extension services limit adoption of improved practices. Women remain largely excluded from more profitable parts of the value chain (generally earn half that of men). Lack of availability of bio-fortified and high micronutrient food crops. access to and use of wild harvested high nutrient foods. This project will reinforce these available resilient and high nutrition options and tap into the existing community structures and habits to improve production and drive market demand for sustainable consumption of high micro nutrient foods. Food and nutrition insecurity are a challenge in all five regions of The Gambia. The Gambia, relying on agriculture, has experienced an alarming increase in malnutrition. Cereal production dropped by 23% (2013-2014), a declining trend. Early millet production declined by 14% since 2009 (NASS 2014). Child wasting (acute malnutrition) prevalent CRR (10.5%) URR (9.5%), WCR (9.0%). Malnutrition is a problem throughout, but varies between different Local Government Areas (LGAs), particularly for mothers, resulting in critical deficiencies for children. – LRR acute malnutrition at 12.8% GAM levels and 2.4% SAM. – 60.3% of women of childbearing age. Rural Women underweight (20%) outnumber those (14%) in Urban areas. 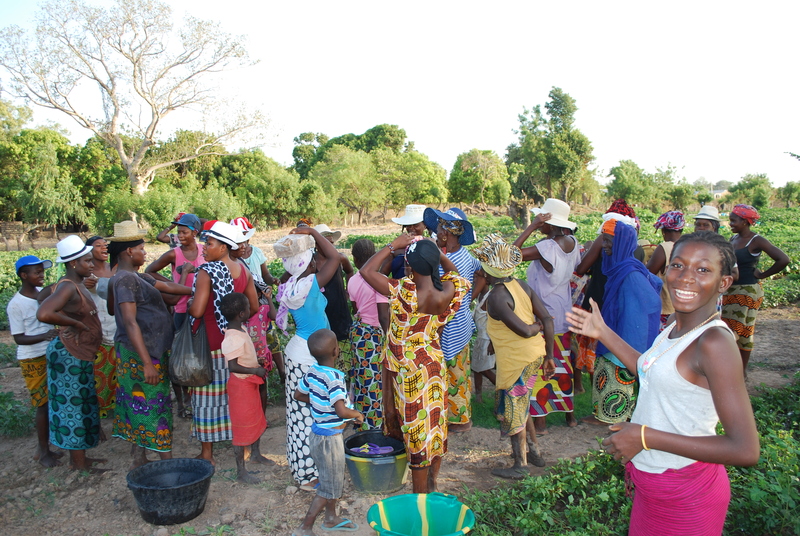 Working in five rural regions of Gambia including direct targeting of Local Government Authorities (LGAs), which are nutrition hot spots, United Purpose (UP) will help the declining nutrition situation. Enhanced production and consumption of African leafy vegetables (ALVs). Educate and sensitise populations on nutritional values (ALVs, OFSP, PM). Encourage their wide consumption among the target groups. Enabling environment for private sector engagement. Create commercial opportunities for farmers. Directly target 18,000 smallholder farmers’ households (75% women farmers) across five regions (URR, CRR N/S, LRR, North Bank Region (NBR) & WCR). – Have the highest rates of malnutrition. Training and capacity building in areas of researching, testing, marketing and business planning support, as well as manufacturing and food testing equipment and capacity. – 100s of value chain service providers (traders, processors, transporters, agro-dealers). Component 1 will develop commercially viable, nutrition-sensitive pro-poor value chains focused on bio-fortified crops (high vitamin A OFSP, high iron and zinc PM and ALVs) from farmers to secure markets and end-buyers. • Introduced OFSP and PM varieties, support from National Agricultural Institute (NARI). • Sent to the communities through contracted seed producers for dissemination. – Individual varieties with local varieties, under a wide range of cropping conditions and a system of ‘mother and baby trials’ at testing sites. Component 2 will focus on creating an environment for an expanded fortification programme in The Gambia. – Private sector, civil society and government participants. – The trade offs, challenges and opportunities of each within the Gambia context. A strong ICT communication campaign is also required to reach/impact population at scale. – Drive behavior change and market demand to ensure uptake of fortified foods, linked to better production practices and nutritional health knowledge. African Leafy Vegetables (ALVs) For a child aged 1-3, 100gr of fresh leaves provide all daily requirements of Ca, 75% of Fe and half the protein needs, as well as important supplies of potassium, B complex vitamins, copper and all essential amino acids. 20gr of fresh leaves provide a child with the recommended dietary allowance (RDA) of Vit A and C. For pregnant and breast-feeding women, moringa leaves and pods significantly contribute to preserve the mother’s health and pass on strength to the fetus or nursing child. 100gr of leaves can provide a woman with over 30% her RDA of Ca and important quantities of Fe, protein, copper, sulfur and B-vitamins. – Orange Fleshed Sweet Potato (OFSP OFSP) is a source of Vit A. All orange varieties are high in Vitamin A, ranging from 3,000 to 16,000 ug/100 grams. Consuming 125gr a day of OFSP meets the RDA. OFSP is complemented by groundnuts with the groundnut oil commonly used in Gambian cooking increasing Vit A absorption. – Pearl Millet (PM) – It has been shown that iron bio-fortified PM doubles Fe absorption in young women and children. Switching from consumption of regular PM to bio-fortified PM we can expect a doubling the intake of Fe. Combined with food preparation that enhances Fe absorption further, and increased consumption of ALV rich in Fe and Vit C, we will offer mothers options for providing young children with meals that fulfill their daily Fe requirements. Read More about our Gambian Development projects via our blogs.